You know 3D printing is starting to go mainstream when it gets an Amazon Gold Box deal, so if you’ve been waiting for an excuse to buy into the hobby, today’s a great excuse. 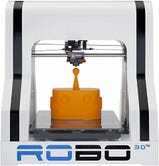 Today only (or until sold out), Amazon will sell you a ROBO 3D R1 Plus 3D printer for $600, or about $140-$200 less than elsewhere. The R1 Plus can print items up to 8" x 9" x 10", and features a maximum resolution of 100 microns (the same as the Makerbot Replicator 2, for what it’s worth). If you’re on the fence, check out Lifehacker’s getting started guide for some inspiration, but remember, this deal won’t be available for long.